Check: still here. Check: still breathing! Check: still a beginner. Still struggling, but who isn't? I'm okay with that. And I want to share this passage, which, save for the last sentence, I have never really heard before. I may have heard it in passing, but never really listened to it. I can't believe that my answer is here, in the Epistles. Of course, it always is, I'm just too stubborn to look all the time. It seems to me there comes a point when we let go of our parents' lifelines and then all of a sudden are in too deep or not deep enough. Many, many times since I've been in Israel (and truth be told before Israel, I guess) I've felt like I'm either "too full or too hungry": not getting enough or getting too, too much. Why can't I be content somewhere in the middle? Well you can; that's life. It seems to me that there are two ways to do things: either to read adventures in books, or to go on adventures with your own two feet. Both ways have their benefits. 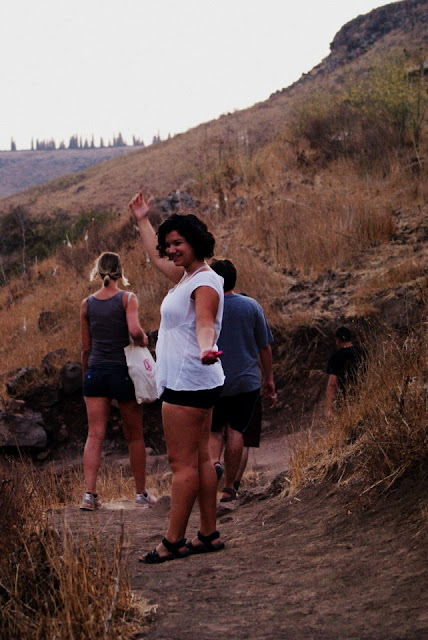 I sat last weekend in the Golan Heights (and hiked, of course) in a Moshav (a small community). The quiet became my quiet and I felt very much at peace. But I just came back from a trek over volcanic rock, up and down hills and jumping into cool, clean water pools. I don't know why, but sometimes I think I have to have everything figured out. (Okay, a lot of the time I think this.) I don't. I can't. I get so afraid of putting myself outside of my comfort zone. I think of myself as a stuffed shirt, an office box, a pale-bellied fish: an unwarented slave to something, some demonic force at work against me (of course) that wants to keep me in a box. But life begins outside this box of vanishing complacency. It used to be a world I only read about in books. And still, sometimes my imagination gets the better of me and alters my perception. Sometimes I think I see illusions--or maybe I'm dehydrated. I always used to dream as a kid, outloud in broad daylight. Really. My life was spent in pretend lands, and sometimes I still think parts of Israel, my time in Israel, is one of those pretend lands in my head that I will write down in between classes in the sixth grade in my black and white composition notebook. Will someone pinch me, please? It exists! And the cool thing is, somehow, I am existing with it. And I think if I can do that here, assuage my life into the messy, crazy, "balagan" of a culture (really, cultures) that operate here, and somehow take care of myself and prosper a tiny bit in the middle of the desert, in a place completely foreign to me, then I think I can do this pretty much anywhere. That's a tall order, but who knows?